Josheen Oberoi of Saffronart explores the stunning new galleries of Islamic art at the Met, a few centuries at a time. 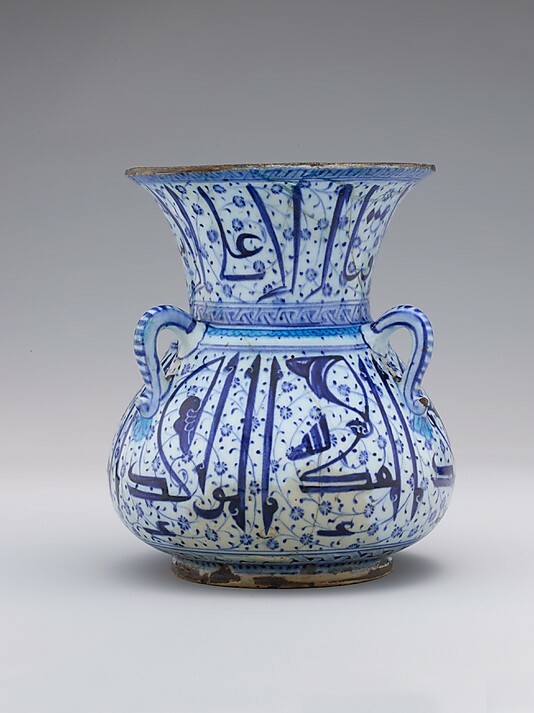 New York: For the last two weeks, I have been posting about the Islamic Art collection of the Metropolitan Museum of Art in New York that opened to the public after an eight year renovation in November last year. For those reading this series for the first time, here is a little introduction on these new galleries. Organized by geographical regions and time periods (from ca. 7th century AD through ca. 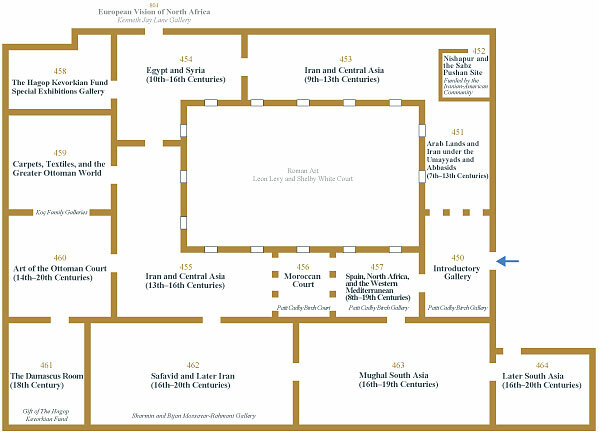 20th century), these fifteen new galleries (Galleries 450 – 464) present historically rigorous exhibits of arts that flourished under the aegis of Islamic rulers through many centuries. These galleries are also incredible in representing the diversity of mediums and contexts of these artistic practices. Today, I look at the arts of the Ottoman Empire (ca 1299 – 1922) that are placed in galleries 459, 460 and 461. Centered in present day Turkey, the Ottomans first emerged as a small principality at the time of the break up of the Seljuq Sultanate in Anatolia and the instability caused by Mongol rule. 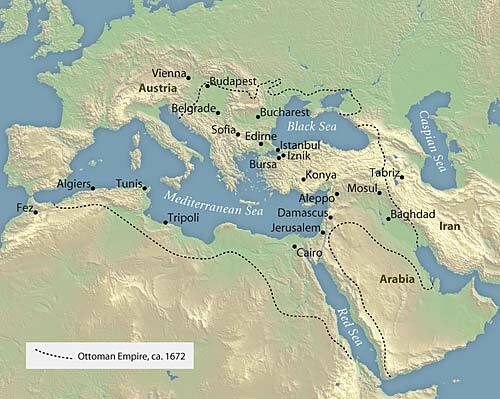 They subsequently expanded towards the east and west, defeating the Mamluk sultanate (discussed in the last post) in 1517, making them the strongest Islamic state in the late 15th and 16th centuries. The Ottoman period, especially in the late 15th and 16th centuries, was defined by the royal arts, centered in Istanbul and various other artistic and commercial centers. This era saw a further development of calligraphy, manuscript production, ceramics, carpets and textiles, amongst others. 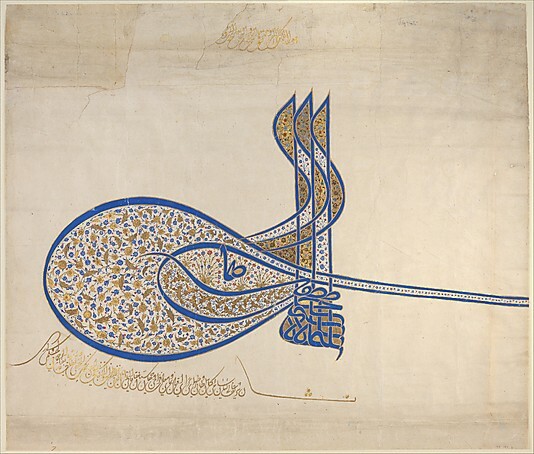 Süleyman‘s rule (1520 – 1566) saw the most powerful Ottoman presence and patronage of the arts, as is reflected in the calligraphic signature on the left in Gallery 460. The tughra was the official individualized seal and signature used by each Ottoman ruler. The aesthetic and skillfulness achieved under Süleyman’s rule is evident in the artistic masterpiece of his signature that went beyond calligraphy to include other Islamic art motifs like floral and vegetal vines. 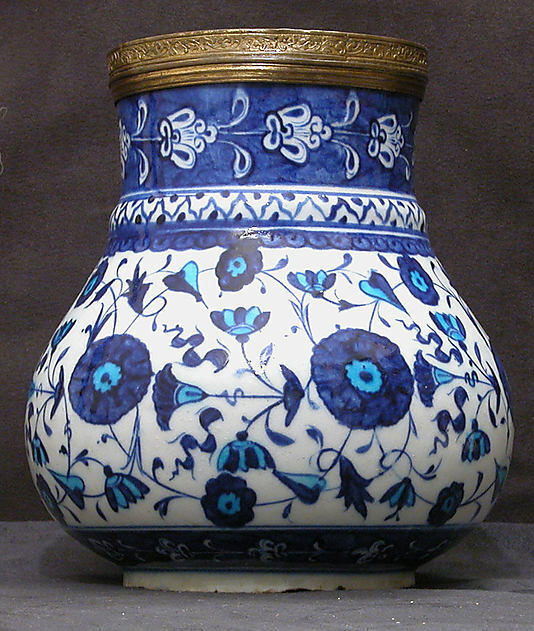 Ottoman rule and saw a continuation of the use of stone paste and blue and white colors. Ceramics at this time often imitated metal works. 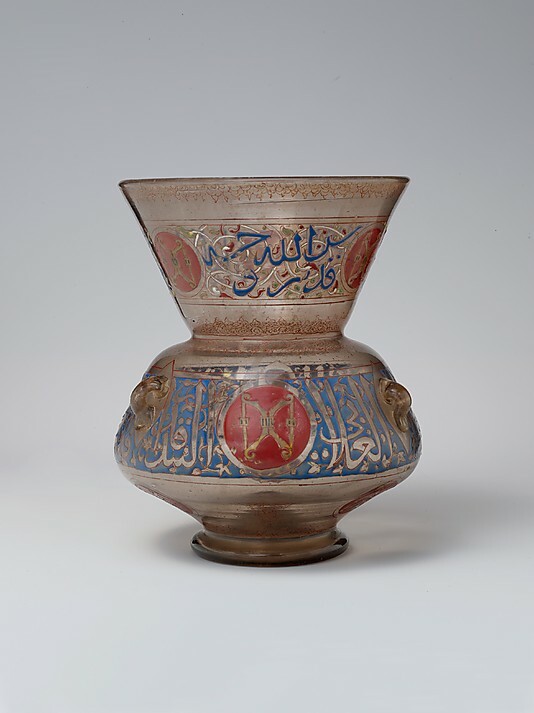 There is also a use of swirling calligraphic elements in some on the pottery that reflects the tughra used by the rulers. This is referred to as the ‘tughra-illuminator’ style. The example below demonstrates not only the ‘tughra illuminator’ style but also echoes the shape of mosque lamps from the 13th century made in Egypt that we saw in the previous post in Gallery 454 and that is also copied below to the right for your reference. This gallery also has examples of royal carpets that were produced in Cairo, Egypt, and exported to the Ottoman court in Istanbul. 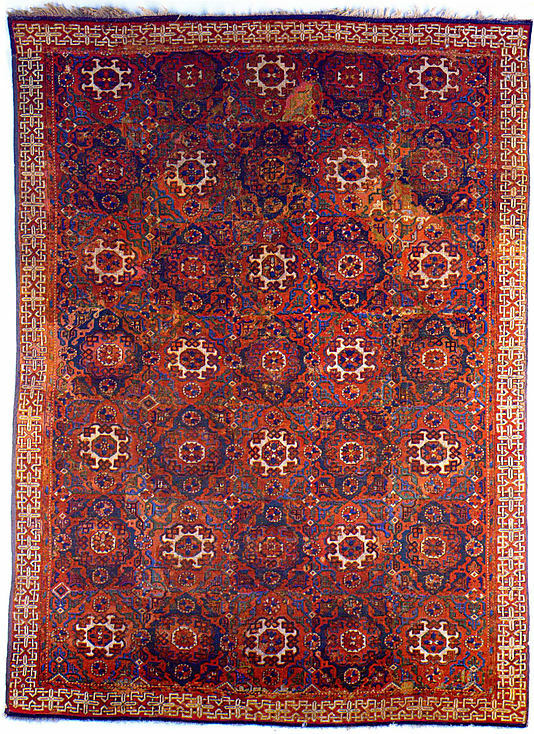 However, the production of carpets was not exclusively for royal use. Gallery 459 has grand carpets that were made and exported to Europe. These carpets were very popular in Europe from the 15th century onwards and can frequently be seen in paintings as well. They have come to be known by the name of the artists who depicted them. The ‘Holbein’ carpet below is named after the artist Hans Holbein the Younger who used a similarly patterned carpet in a portrait he had painted. A recreation of an upper class winter reception room, the Damascus Room provides us with a clear example of late Ottoman architecture. Originating in Damascus, Syria, it also suggests the wide ranging influence of the Ottomans over the provinces it ruled over. This room in the museum consists of the original ceiling and walls, constructed of fine woodwork, and containing original inscriptions. You can read more about the history of this room and its configuration here. I had promised this would be the final post, but to do these galleries justice, I am going to end this one here. Next week, I will talk about art from Iran, from the 16th to 19th centuries. And the week after, we’ll look at Mughal South Asia and 19th century Company paintings. 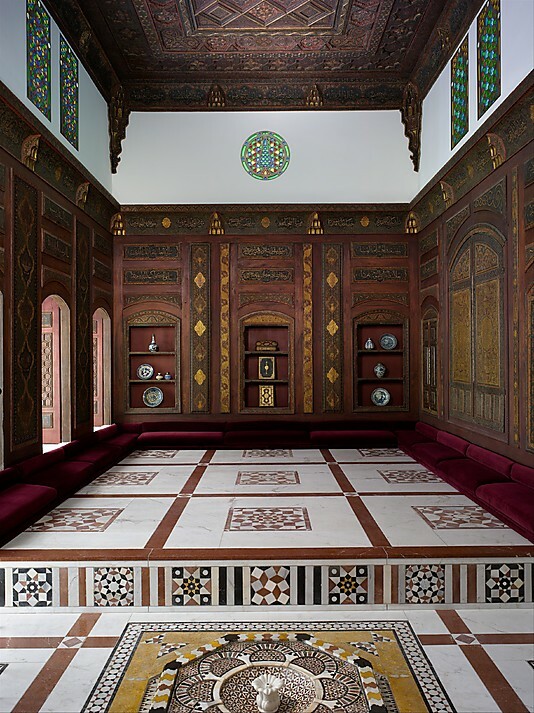 Till then, I leave you with an image of the intricately constructed, beautiful Damascus Room. Make sure to visit! Excellent post. I used to be checking constantly this blog and I am inspired! Extremely helpful info particularly the ultimate phase 🙂 I care for such info a lot. I was looking for this certain info for a very lengthy time. Thanks and best of luck.